Originally released 21st May 2007. Review originally published 19th July 2007. Whatever you say it is, small business indie is not. In less than 3 years the Kaisers, Monkeys and Killers (think their pre jettisoned origins) have sold more than 7 million albums. Since the 2005 release of The Cribs highly acidic/melodic and critically acclaimed The New Fellas a conveyor belt of the less worthy have seemingly passed the Wakefield trio by, stealing their celebrity and suggesting that their legacy might well be rendered as scenester throwaways of over-refreshed self fulfilling prophesisation. The band’s point of view was of course always from the sticky fingered windows looking in, hating the players and the game, so of all things you’d least expect to hear circulating around a new Cribs record, a whiff of hype began to emerge, with a star producer (Franz Ferdinand’s Alex Karpranos), studio time in far-flung Canada, plus an ecstatically received low-key tour of lilliputian venues succeeded in re-establishing the trio as a question still worth asking. So what do Britain’s anointed punk garage alter-saints do on the verge of their coronation? Well, exactly what the contrarian kings want to. A cred maintaining nudge towards the mainstream? Children’s choir? Celebrity collaborators? remix by Simian Mobile Disco? Answer: Yes and no. Because whilst their peers have cornered the market in lowest common denomination, they’ve also proved that exploiting pop dynamics doesn’t necessarily mean trading in all of your lacerating New Yorkshire expurgation. Without much heritage, Kapranos should rightly be praised for astutely realising early on in the process that he is no Spector and this is no End Of The Century; opener Our Bovine Public finds Jarman spitting feathers again at the band’s unashamed copyists, proclaiming dismissively “You’d never exist if you wasn’t generic” whilst the Scot’s subtle polish adds angularity and separation between words, rhythm and harmonies. The coruscating lyrical field of view is mercifully unchanged, acerbic, wicked, spiteful and the deserving targets – terminally flawed characters, jealousy wracked victims of romance and scummy blokes by the dozen – are all dissected with tenderness and venom in equal measure. At times, it’s breathless and brilliant, from the screeching, larynx grating Men’s Needs to the Strokes-with-a-purpose of Major’s Tilting Victory, but the pervasive sense of melancholy, that forms the backbone of the bands worth, whether playing fast or slow, can’t be quelled, elucidated in the complex fragility of I’ve Tried Everything and closer Shoot The Poets. A little art for art’s sake, Sonic Youth’s Lee Ranaldo makes a guest spoken word appearance on the laboured Be Safe – and it’s not wrong because The Cribs haven’t earned the right to try, it’s just the kind of aural abstractism that his mother ship has done two dozen times more vitally before. 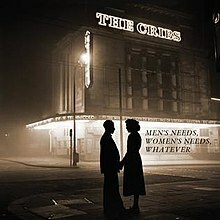 Men’s Needs.. could’ve been many things – a hit toting nod towards better sales for one thing – but ultimately only time and exposure will tell whether it has the power to stretch the band’s appeal beyond their core of acolytes. It’s music which deserves to be listened to in stadiums, although it’ll probably be only heard in bars.